Direct mail has shown itself to be a worthy contender for most-valuable-player status in today's marketing toolbox, despite a steady flow of rumors pointing to its imminent death in the face of the success of email marketing. In fact, recent statistics show that not only is direct mail not on the decline, it is doing quite well in the marketing battle for customer attention. According to the DMA 2015 Statistical Fact Book, in 2013, almost half of all households reported scanning or reading direct mail, versus not reading advertising mail at all. Customer attention is one thing, but what about response rates? In this, too, direct mail is thriving, particularly within the financial services industry. The DMA reports that while response rates for many marketers have declined since 1987, the response rate to first class mailings for credit card marketers has doubled between 1987 and 2013. And in terms of customer preferences, direct mail is consumers' preferred method of receiving marketing from banks. But direct mail is not just alive and well; when combined with the latest in digital marketing technology, direct mail offers the financial services organization multiple options to connect in meaningful ways with its customer base. Digital technology has been applied to email marketing for years now, providing email marketers with a number of important tools, such as personalization and dynamic messages based on user behavior. This technology can also be applied to direct mail, enhancing the ability of your direct mail campaign to stand out and generate an outstanding response from your customers. Personalization is one of the key factors in successful marketing campaigns. Today's digital technology enables you to add a level of personalization to your direct mail pieces that goes well beyond traditional methods. As Adobe Campaign UK Sales Director Mathieu Lavedrine notes, in today's marketing world, personalization is about more than just using the customer's name. Your customer receives a mailing from you in which there are multiple references to a personalized URL (PURL). At some point after reading the direct mail piece, your customer enters the PURL into her laptop's browser, and finds herself on a landing page that's been tailored to her specific financial needs. Another customer receives a direct mail postcard featuring a mobile barcode such as a QR code. On scanning the code with his smartphone, he's taken to a page featuring personalized audio or video providing further details of financial products you discussed with him in a previous meeting. Personalization can also be simpler while still retaining its effectiveness. For example, a direct mail piece might include two maps, one detailing the branch location closest to your customer's residence and the other the location closest to his place of work, along with details about each location's opening and closing hours. By utilizing both print on demand and personalization technologies, your mailing isn't one everyone in the neighborhood will get. Instead, you can individually tailor each piece to the needs of each customer. 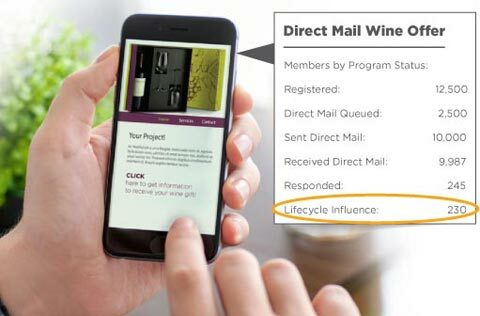 Digital technology also enables you to use customer behavior to trigger your direct mail send. Layered on top of effective personalization, direct mail marketing triggered by your customer's behavior provides a more meaningful experience. For example, the client who's just had a meeting with you might receive a mailing three days later that references and builds on the topics discussed in that meeting. Another client who has expressed interest in a particular product may receive a direct mail piece providing more information, followed by an email referencing the mail piece. In addition to customer behavior, mail can also be triggered by any trackable or recorded metric. Depending on what your organization tracks, metrics such as response time or lead scores can trigger specific direct mail sends. Digital technology can also be used to intensify your client's exposure to your brand. Combined with new technology, direct mail is no longer an isolated channel; it can be employed with channels like SMS/text marketing, mobile marketing and email marketing. One effective approach is to time the delivery of marketing material through a number of channels, using complementary messages in each channel. Make sure your customer doesn't feel inundated. If the complementary messages are well-crafted and your customer is offered a targeted payoff, such a campaign can be very effective. 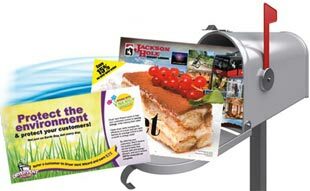 Direct mail can also be used to lead your customer to action in another channel. For example, mobile barcodes can effectively merge your direct mail send with your mobile marketing campaign. This seamless transition from one channel to the other enables you to utilize the unique features of your print marketing to enhance your customer's mobile experience. In the past, you could never pinpoint with sufficient accuracy when a direct mail piece might land in your client's mailbox. Today, however, using technology such as USPS's Intelligent Mail Barcode, you can identify when your mailer was delivered with a much higher degree of accuracy. Knowing when your direct mail piece has been delivered enables you to time your follow-up at just the right time, whether you're doing so through social media, email or with a phone call. Using such targeted, timely follow-through enhances the personalization your client is already experiencing. Whether it's a tweet to let your customer know you're available to answer questions or a phone call offering your time and assistance, timing your follow-up closely on the heels of your direct mail piece can only strengthen your connection with your customer. While direct mail using standard mailing pieces continues to be effective, digital technology has broadened the playing field for direct mail marketing. Your direct mail campaign is no longer restricted to the traditional two dimensional letter, postcard or brochure. Three dimensional pieces are also possible, and while the initial costs may be higher, an effective dimensional mail campaign can solicit a greater response rate or conversion rate that can offset those initial costs. This sort of campaign becomes very cost effective when it targets high value prospects that will yield a huge return. Dimensional mailings also offer the financial services marketer the opportunity to build and implement a more innovative direct mail campaign. Dimensional mail pieces can provide you with an opportunity to inject some humor into a campaign. This may be an effective approach for marketing to, for example, the millennial market. You could also use dimensional mailings to promote a sense of urgency. American Express used a dimensional direct mail campaign to drive customers to a travel site where destinations are auctioned off every day. The direct mail pieces consisted of a small box containing cookie fragments and a fortune that read "Get the best out of Hong Kong before someone else does". The result? A fun piece that also stressed the need for quick action. By utilizing new digital marketing technology, you gain the ability to control, manage and execute your financial services direct marketing campaign. Today's innovative digital technology gives you the opportunity to design and implement campaigns that can be uniquely targeted to the needs of your individual clients, providing them with a more meaningful customer experience and boosting the quality of their connection to your organization's brand. If you're ready to test direct mail for your businesses, PFL can help you get started. We've got over twenty years of experience printing the highest-quality marketing materials, helping businesses get started with direct mail and guiding our clients through graphic and print design. Our integrated marketing technology solutions will help you integrate your physical and digital marketing efforts to produce greater results. Give us a call at 800-­930-2423 and talk to a customer advocate about your needs.